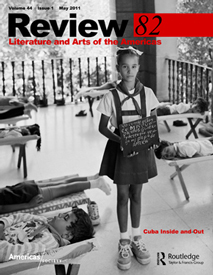 Review 82 “Cuba Inside and Out,” guest-edited by José Manuel Prieto (Rex) and Anke Birkenmaier (Indiana University), compiles a creative section of texts by Cuban writers representing various generations, aesthetics, countries of residence, and positions vis-à-vis mainstream culture; and an academic section of articles by leading Cuban and U.S. scholars on a breadth of topics including a study of iconic Cuban writers and new media in Cuban literature today. Featured writers include Damaris Calderón, Abilio Estévez, Juan Carlos Flores, Ernesto Hernández Busto, Ena Lucía Portela, Reina María Rodríguez, Rolando Sánchez Mejías, and José Triana. Participating scholars include Roberto González Echevarría, Rachel Price, and Rafael Rojas. The issue also includes pieces on Cuban artist Consuelo Castaneda and on Alejo Carpentier's puppet opera Manita en el Suelo, and reviews of newly translated titles of works by Miguel Barnet, and other Cuban/Latin American authors. Learn more or purchase Review 82. Subscribe to the magazine.